(From left to right) Pierre Pfeﬀer, Fabian Hartmann, Sven Höﬂing, Martin Kamp, Lukas Worschech. 1Technische Physik, Universität Würzburg, Physikalisches Institut and Wilhelm Conrad Röntgen Research Center for Complex Material Systems, Würzburg, Germany. 2SUPA, School of Physics and Astronomy, University of St. Andrews, United Kingdom. 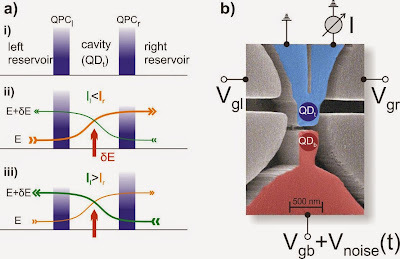 In a recent experiment  we demonstrated the conversion of voltage fluctuations into a directed current on the nanoscale in a system consisting of two Coulomb-coupled quantum dots. The use of external gates allows a control of the current magnitude and a switching of its direction. The work was inspired by theoretical proposals by Sánchez et al. and Sothmann et al. . Possible future applications include energy harvesting as well as local cooling on the nanoscale, both vital to the further development of autonomous and energy-saving electronics. Since heat and ﬂuctuations are especially challenging factors in miniaturizing electronic circuits , the design of heat engines and rectifiers has become a central point of research in nanoelectronics and led to concepts and devices such as Brownian- and Büttiker-Landauer-motors [5,6] phonon rectiﬁers [7,8] and piezoelectric nanogenerators [9-10]. Despite being diverse concepts, they have in common an interplay of non-linearity, a certain form of symmetry breaking and the presence of fluctuations. For instance, Brownian motors enable a unidirectional particle flow even when there is no net average force in one direction, if the device’s potential is asymmetric. In this context, Sánchez et al. and Sothmann et al. theoretically examined rectifying devices which stand out because of their conception as three terminal devices, which allows a decoupling of the directions of energy flow and charge current. Figure 1: Illustration of the energy transfer. Coulomb-coupling transfers energy from higher-energy electrons in the lower cavity to lower-energy electrons in the upper one. The basic operating principle of the Coulomb coupled rectifier is illustrated in Fig. 1. 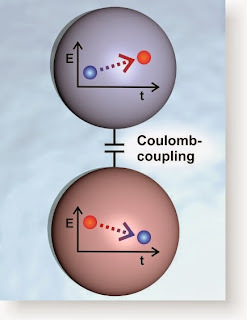 Energy is transferred locally between two Coulomb-coupled cavities. If the electrons in one cavity (lower sphere in Fig. 1, in the following named QDb ) have on average higher energies than the electrons in the other cavity (upper sphere, QDt ), electrons in the ﬁrst cavity can change into a lower-energy state and transfer the energy difference δE to electrons in the second cavity by means of Coulomb-interaction. No particle exchange takes place between the two cavities. 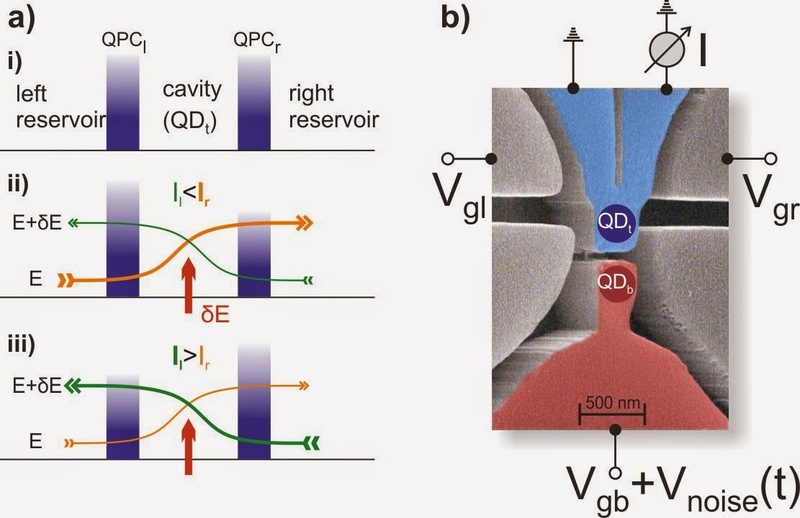 If QDt is coupled to two reservoirs by means of two quantum point contacts (QPC), a rectified current through the upper cavity occurs if three essential requirements are met: The amount of fluctuations in the upper and lower cavity have to differ, the transmissions of the QPCs have to be energy-dependent, and the two QPCs have to be asymmetric (Fig. 2a). This is for instance possible by applying an external electric ﬁeld and enables a switching of the current direction. Figure 2: a) Schematic operating principle. i): QDt is connected to the outer reservoir by two transport barriers. ii): Asymmetric conﬁguration with charge current ﬂow to the right. iii): Asymmetric conﬁguration with charge current ﬂow to the left. b) Electron microscopy image of the sample (side view) together with a schematic of the applied voltages. Vgl and Vgr allow a switching between the conditions displayed in a) ii) and a) iii). To realize this device, we grew a GaAs/AlGaAs semiconductor heterostructure with a high mobility two-dimensional electron gas by molecular beam epitaxy. Electron beam lithography and dry chemical etching techniques were used to deﬁne the structural layout. Fig. 2b shows a side view electron microscopy image of the sample and is overlain with a schematic representation of the QDs indicating the two separate parts of the system (upper subsystem where the resulting current flows in blue and lower subsystem where the fluctuations occur in red). Moreover, the connected voltages are schematically added to the picture. Vgl and Vgr are the gate voltages applied to the upper side gates which allow us to individually manipulate the transmission coefficients of the two QPC’s. For instance, applying a negative voltage to Vgl and a positive one to Vgr opens the left but closes the right QPC and vice versa. In order to keep the central electrostatic potential of QDt constant while asymmetrically controlling the transmission of the left and right QPC we varied the voltages in push-pull conﬁguration with Vgl = -Vgr. The lower side gates remain unused in the presented experiments. The static gate voltage Vgb further allows to tune the transmission of the top current carrying system. A noise voltage Vnoise is supplied to the lower reservoir. All experiments reported here were conducted at 4.2 K in the dark by immersing the sample in liquid helium. Figure 3: a) Dependence of output current on the voltages applied to the two laterally defined side gates for increasing noise from 7.6 to 144 mV in steps of 15 mV. The current direction and magnitude can be altered by the gate voltage configuration and noise amplitude, respectively. b) Output powers P against the counteractive voltage Vlr for different noise amplitudes increasing from 7.6 to 150 mV in steps of 15 mV. c) Maximum output powers P max versus σnoise. Fig. 3a shows the rectified current through QDt for different noise amplitudes from 7.6 to 144 mV when changing the gate voltages Vgl and Vgr. Notably, without noise, no current could be measured. Starting with a gate voltage conﬁguration of Vgl = − Vgr = − 2 V and increasing the push-pull voltage initially increases the current from zero to a maximal value which depends on the applied noise amplitude. Thereafter, I decreases again and vanishes completely at around Vgl = 0.01 V (independently on the noise amplitude). A further increase of Vgl changes the current direction. I therefore becomes negative, reaches a minimum and ﬁnally increases back to zero again. In order to harvest useful work from the rectifier, it has to power a load or, equivalently, the generated current has to ﬂow against an applied voltage difference. Consequently, to measure the output power P, a voltage difference Vlr counteracting the current was applied between the channels. The output power is the product of the current and the counteracting applied voltage. Fig. 3b shows the voltage dependent output power for different noise amplitudes. The output power has a parabolic dependency on the applied voltage and vanishes at two particular points: at Vlr = 0 V (maximal current) and at the stopping voltage Vst (no current) which depends on σnoise. Fig. 3c presents the maximum output powers, obtained at half the stopping voltage, depending on the noise amplitude. There, a quadratic dependency on the noise amplitude can be seen with a maximum output power value of Pmax = 24 pW. 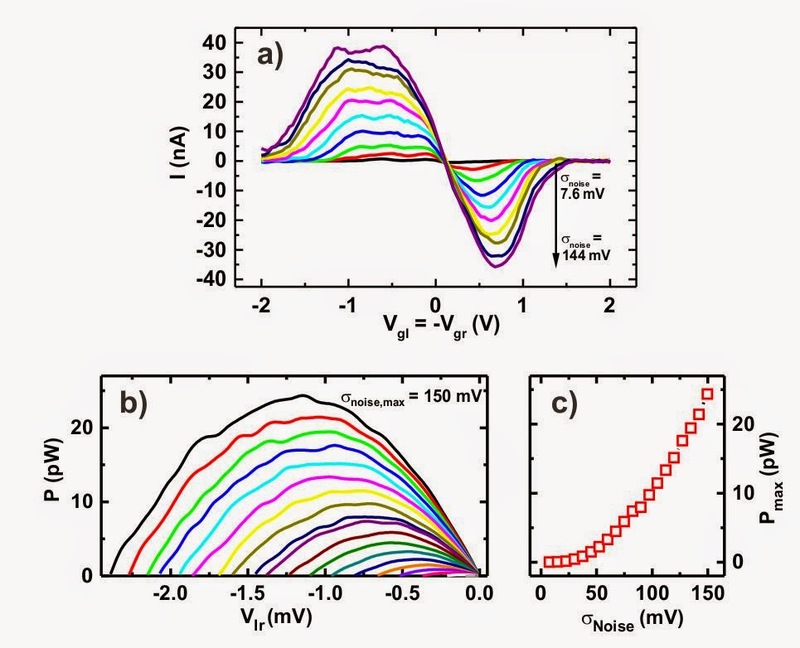 In conclusion, we demonstrated a rectification mechanism via Coulomb-coupled quantum dots. The presented findings are a step towards reducing the power consumption of electronic devices and may allow a further miniaturization of electronic circuits and thus pave the way towards sustainable, efficient and autonomous electronics. F. Hartmann, P. Pfeﬀer, S. Höﬂing, M. Kamp, L. Worschech, "Voltage Fluctuation to Current Converter with Coulomb-Coupled Quantum Dots". Physical Review Letters, 114, 146805 (2015). Abstract. Rafael Sánchez, Markus Büttiker, "Optimal energy quanta to current conversion". Physical Review B, 83, 085428 (2011). Abstract. Björn Sothmann, Rafael Sánchez, Andrew N. Jordan, Markus Büttiker, "Rectification of thermal fluctuations in a chaotic cavity heat engine". Physical Review B, 85, 205301 (2012). Abstract. Mehdi Asghari, Ashok V. Krishnamoorthy, "Silicon photonics: Energy-efficient communication". Nature Photonics, 5, 268 (2011). Abstract. R. Dean Astumian, Peter Hänggi, "Brownian Motors". Physics Today, 55, 33 (2002). Link. M. Büttiker, "Transport as a consequence of state-dependent diffusion". Zeitschrift für Physik B, 68, 161 (1987). Abstract. Rolf Landauer, "Motion out of noisy states". Journal of Statistical Physics, 53, 233 (1988). Abstract. C. W. Chang, D. Okawa, A. Majumdar, A. Zettl, "Solid-State Thermal Rectifier". Science, 314, 1121 (2006). Abstract. Nan Zeng, Jian-Sheng Wang, "Mechanisms causing thermal rectification: The influence of phonon frequency, asymmetry, and nonlinear interactions". Physical Review B, 78, 024305 (2008). Abstract. 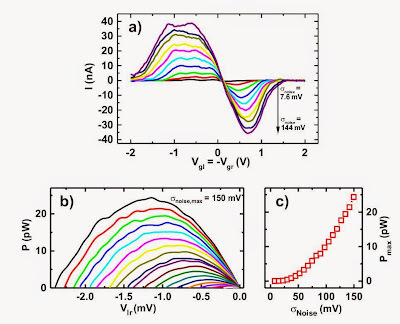 Zhong Lin Wang, Jinhui Song, "Piezoelectric Nanogenerators Based on Zinc Oxide Nanowire Arrays", Science, 312, 242 (2006). Abstract.